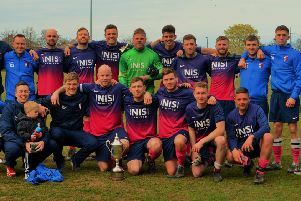 Alnwick Town Ladies were in celebratory mood on Sunday when they finally got their hands on the Northumberland County Women’s League championship trophy. The girls had secured the title a week earlier, and received the silverware after their final game of the season, a convincing 7-0 home win over Bedlington Town at St James’ Park. Goalscorers on the day were Munro (2), Patterson, hetely, Tang, Barrett and McFall. The team have enjoyed considerable success in their first full competitive season, having only been set up just over a year ago. They now look forward to the Cup Final against Newbiggin later in May.